Former secretary of state Hillary Clinton may be leading Sen. Bernie Sanders (I-Vt.) among pledged delegates to the Democratic National Convention. But, Sanders argued Sunday, it would be “virtually impossible” for her to win the nomination with their support alone. “In other words, it will be a contested convention,” he told reporters at the National Press Club in Washington, D.C. In a 17-minute address, Sanders turned his attention to those he said would have to push either candidate over the finish line: the Democratic Party’s 719 superdelegates. Unlike pledged delegates, those elected officials and party leaders can vote for whichever candidate they choose. Sanders’ speech came just days after he lost four out of five East Coast states and then announced that he would lay off “hundreds” of campaign staffers. 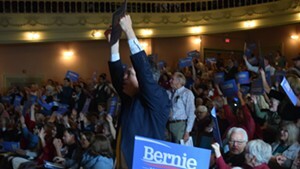 But throughout Sunday’s address, and the question-and-answer session that followed it, the Vermont senator sounded a defiant tone. Sanders did admit that he faced “an uphill climb” in securing the nomination, but he pledged to “fight for every vote and delegate remaining.” The candidates will face off Tuesday in Indiana. Later this month, they’ll meet in West Virginia, Kentucky and Oregon. Sanders and Clinton both appear focused on California, which will award 475 delegates on June 7. According to the Associated Press, Clinton is leading Sanders 1,645 to 1,318 among pledged delegates. Factoring in superdelegates who have made their preferences known, she’s ahead 2,165 to 1,357. Candidates need 2,383 delegates to win the nomination. Sanders’ insurgent candidacy has been fueled by contributions from small-dollar donors, but new figures released by his campaign Sunday indicate that his fundraising has begun to ebb. In April, according to spokesman Michael Briggs, Sanders raised $25.8 million — an impressive number, but far less than the $44 million he raked in the month before.